Feb 15, 2018 - Where Did Your Pay Raise Go? Next Generation is CWA Strong! AFA-CWA members at Alaska Airlines and the former Virgin America Airlines will be voting on a new joint collective bargaining agreement (JCBA). The agreement covers more than 5,400 Flight Attendants. "We worked hard to achieve improvements for the Alaska Airlines Flight Attendants while simultaneously balancing the need to quickly address the disparity for the former Virgin America Flight Attendants working under their current pay and work rules. The JCBA accomplishes those goals and provides for a smooth path to combine the two flight attendant groups," said Jeffrey Peterson, AFA-CWA president at Alaska Airlines. Virgin America Flight Attendants joined AFA-CWA in April 2017 shortly after the announced merger of Alaska Airlines and Virgin America. Members of Local 6143 showed their support for AT&T Mobility workers in District 3 who are bargaining for a fair contract. Pictured: Jesse Espinosa, VP; Marsha Watson, Chief Steward RSC; David Garcia, EVP; Stella Morales Cricket, Steward; Jose Alvarez, RSC; Diane Lutz, SSR, and Aissa Tristan, Chief Steward RSC. Parking Production Assistants (PPAs) in New York City voted unanimously to join CWA Local 1101 on Monday. The nearly 600 PPAs are employed by ABC, CBS, NBC TV, NBC Cable, HBO, and SONY. They secure parking in the New York City area for film and television productions, usually arriving 12 to 24 hours prior to production and working through the night in their personal vehicles to ensure that parking spaces are secured for production vehicles and equipment. The work requires PPAs to spend long hours alone, overnight, usually without access to a bathroom, and risk violent altercations with drivers seeking parking. Prior to the vote, they were the only group of workers in the multi-billion dollar film and television industry who were not union members. 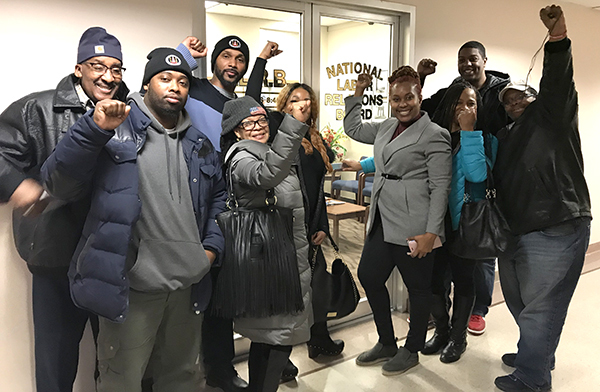 "This vote was about dignity, about humanity," said Lanere Rollins, a PPA who spoke last month at the National Action Network’s Martin Luther King, Jr. Day celebration about the organizing efforts. "Film and TV productions couldn't happen without us, but PPAs have been on the bottom rung of the entertainment industry for a long time. Not one PPA in the city voted 'no' for the union, because we're stepping up to demand the respect and fair treatment that we deserve." Parking Production Assistants (PPAs) in New York City voted unanimously to join CWA Local 1101. As contract negotiations for thousands of passenger service professionals at American Airlines subsidiary Envoy Air continue, more than 80 members of Congress sent a letter to American Airlines CEO Doug Parker on February 8 urging him to "conclude your collective bargaining negotiations and ensure that all of your employees can earn a living wage." Parker made more than $11.3 million in 2017; his company posted $1.9 billion profits; yet thousands of Envoy agents make as little as $9.48 an hour. The letter's signatories also call on American to follow through on promises made in support of recent corporate tax cuts, encouraging the company to ensure workers' salaries "provide for the ability to support themselves and their families." "We were surprised to learn that many of these agents earn less than $11 an hour and, as a result, must deal with constant churn at work and struggle at home to make ends meet," the letter states. Calling on the company to raise pay, the letter concludes: "There is no stronger investment that American Airlines can make for its future, the future of the traveling public, and the future of our communities." Takisha Gower, a passenger service agent for Envoy, the air carrier that was previously known as American Eagle and is owned by American Airlines, welcomed her recent $1,000 bonus, which the company credited to the “new tax structure.” She is much more concerned, however, about her base pay week to week, a subject of longstanding contract negotiations. "It was appreciated, but it doesn't fix the long term," Ms. Gower said of the bonus. "We need a livable wage that we can support our families off." "A lot of employees qualify for government assistance," she added. “Some have to work 60 hours a week to make ends meet." The National Labor Relations Board recently issued a complaint against GDIT alleging unfair labor practices, including a finding that GDIT "informed employees that it would be futile" to join a union because their wages would not "increase absent an act of Congress." In reality, the workers have a legally-protected right to come together to form a union and bargain with their employer for higher pay. On the campaign trail, Donald Trump promised to fight for working families. But his repeal of the executive order on fair pay and safe workplaces is one of the many examples of his administration putting the interests of big businesses like GDIT ahead of real working families. On February 24, in cities across the country, thousands of working people are uniting to demand an end to an economy that's rigged in favor of the wealthiest and most powerful. In late February, the Supreme Court is hearing Janus v. AFSCME Council 31. This case is the culmination of decades of attacks on working people by corporate CEOs, the wealthiest 1%, and the politicians that do their bidding to rig the economy in their favor. The forces behind it simply do not believe that working people should have the same freedoms and opportunities as they do. It's up to us to fight back. On the Working People's Day of Action, we will stand up for the freedom of working people to join together in strong unions and fight for decent and equitable pay for our work, affordable health care, quality schools, vibrant communities, and a secure future for all of us. Find your local February 24th Working People's Day of Action here! 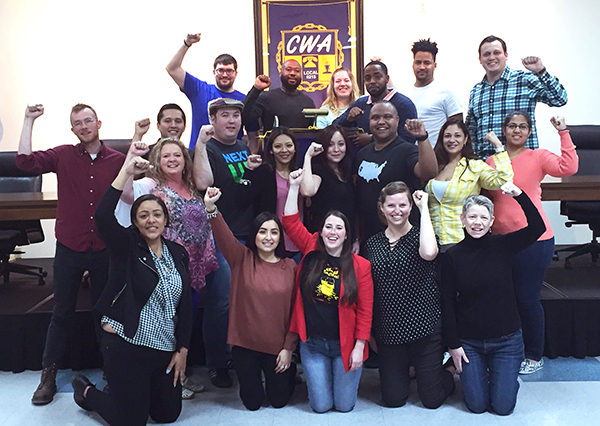 Earlier this month, CWA activists gathered in Dallas, Texas, for the Next Generation-CWA Strong training. The participants included lead activists from every CWA district as well as the AFA-CWA, IUE-CWA, and Public, Healthcare, and Education Workers (PHEW) sectors. In addition, six Texas-based activists attended. Participants learned working class history and practiced important organizing skills such as one-on-one conversations with co-workers. The activists from Texas developed a plan to support internal organizing and increase Political Action Fund contributions by young members across their district. After the training, the lead activists held a half-day planning meeting to set their agenda for 2018. Vice President of Telecommunications and Technologies Lisa Bolton, who directs the Next Generation program, said, "Our Next Gen/CWA Strong training was a huge success, and we couldn't have done it without support from District 6 Vice President Claude Cummings. Now that we have a successful model, we hope to train young activists in other districts. Our goal is to engage our young members in the union at every level. That's how we build our movement for social and economic justice!" CWA activists gathered in Dallas, Texas, for the Next Generation-CWA Strong training. 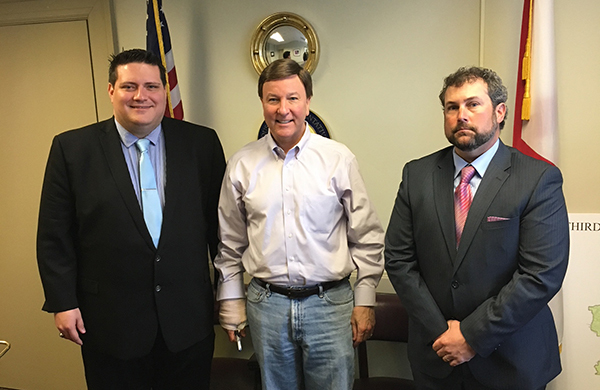 Rep. Mike Rogers (R-AL) (center) is the newest co-sponsor of HR 1300, the U.S. Call Center Worker and Consumer Protection Act. The bill, supported by CWA, would protect U.S. call center jobs and crack down on U.S. companies that offshore call center jobs. Pictured with Bruce Hembree (right), president of CWA Local 3909. 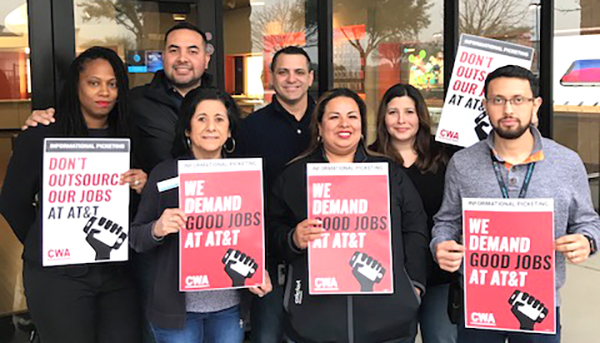 CWAers participated in an AT&T Brigade Peer-to-Peer Texting Campaign in Washington, DC, using peer-to-peer texting to identify organizing leads among wireless industry workers and encourage wireless workers to sign on to the Wireless Workers United Statement of Principles. Twenty-two AT&T Mobility members from across the country were trained and participated in the peer-to-peer texting outreach program, making individual contacts with thousands of CWA Mobility members over the course of two days. 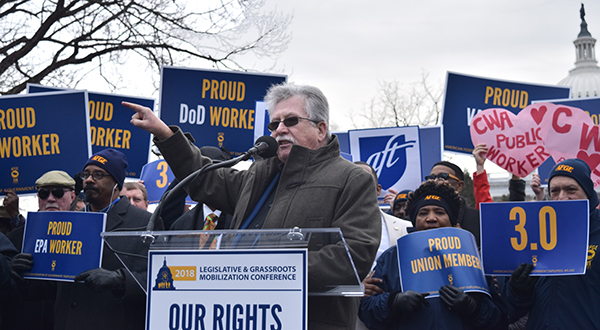 CWAers rallied in Washington, DC, in solidarity with our American Federation of Government Employees (AFGE) sisters and brothers who are under attack from the Trump Administration and Republicans in Congress. Federal workers keep our ports safe, our environment clean, and our labor standards upheld. They are now being targeted for politically-motivated budget cuts and firings by President Trump and his corporate backers. Watch President Shelton's speech here. CWAers rallied in Washington, DC, in solidarity with AFGE. 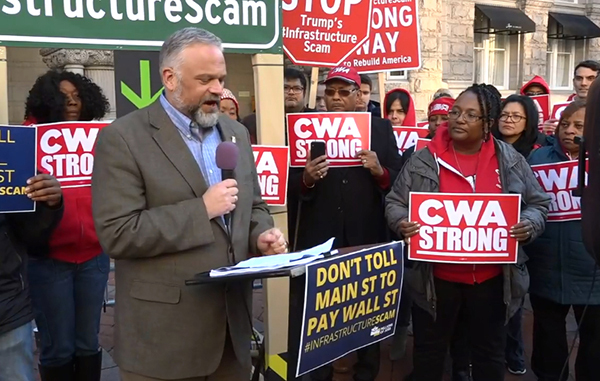 CWAers joined with union members and activists in Washington, DC, to fight back against President Trump's new infrastructure plan, which is as much of Wall Street giveaway as his tax plan. CWA Legislative Director Shane Larson spoke at the rally. CWA District 6 Vice President Claude Cummings (front, second from right) also attended the event. 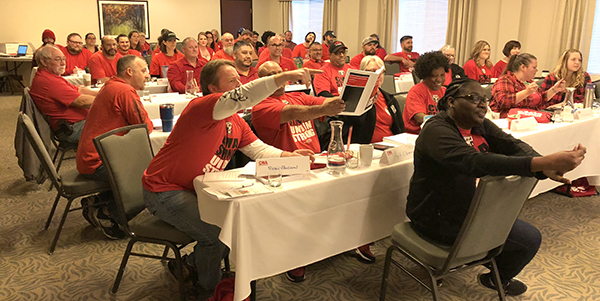 CWAers gathered at a D7 Officer Training in Vancouver, Wash., to learn about the roles of local officers, how to make CWA STRONG, setting goals for their local, establishing strong steward structures, and much more.